The trepidation — and inevitable outrage — with which much of the media has greeted Facebook’s latest change to the News Feed algorithm seems rather anticlimactic. Nearly three years ago I wrote in The Facebook Reckoning that any publisher that was not a “destination site” — that is, a site that had a direct connection with readers — had no choice but to go along with Facebook’s Instant Article initiative, even though Facebook could change their mind at any time. A few months later, in Popping the Publishing Bubble, I explained why advertising would coalesce with Google and Facebook; that is indeed what has happened, which is the real problem for publishers. Facebook’s algorithm change simply hastens the inevitable. The story for media is for all intents and purposes unchanged: success depends on building a direct relationship with readers; monetizing that relationship (likely through subscriptions, but not necessarily); and leveraging Facebook as an acquisition channel for those long-term relationships, not short-term page views. If anything this change will help reader-focused publications: users will be more likely to see links shared by their friends, enhancing the word-of-mouth marketing that is the foundation of reader-centric publications. We feel a responsibility to make sure our services aren’t just fun to use, but also good for people’s well-being. So we’ve studied this trend carefully by looking at the academic research and doing our own research with leading experts at universities. The research shows that when we use social media to connect with people we care about, it can be good for our well-being. We can feel more connected and less lonely, and that correlates with long term measures of happiness and health. On the other hand, passively reading articles or watching videos — even if they’re entertaining or informative — may not be as good. This change is primarily focused on doing right by our community, because we actually believe that by doing right by the community in the long run will be good for the business and so we just try to take a long term approach to any question like this. I absolutely believe the last part of that quote: Facebook is taking a long-term view, and it would only make this change were it right for the business. I’m just not entirely convinced that Zuckerberg and Mosseri are telling us the entire story. Start with Zuckerberg’s claim that this change will reduce “the time people spend on Facebook and some measures of engagement.” Mosseri said that would be mostly due to less time spent watching video, given that video content would likely be hurt by this algorithmic change. That in and of itself is certainly interesting; Zuckerberg has been pushing the importance of video on earnings calls for some time now, and no wonder: TV advertising money remains the proverbial gold-at-the-end-of-the-rainbow for all advertising-based tech companies. Is Facebook giving up on its leprechaun dreams? For the video tab, the goal that we have for the product experience is to make it so that when people want to watch videos or they want to keep up to date on what’s going on with their favorite show or what’s going on with the public figure that they want to follow, that they can come to Facebook and go to a place knowing that that’s going to show them all the content that they’re interested in. So that’s a pretty different intent than how people come to Facebook today. Today, for the most part, people pull Facebook out when they have a few minutes, when they want to catch up and see what’s going on in the world with their friends and in the news and everything that’s going on. That’s very different from saying, hey, I want to watch video content now. And that’s what I think we’re going to unlock with this tab. My takeaway at the time was that Facebook was effectively building two video products: one for content people wanted to watch (the video tab), and the other for content people watched because it was stuck in front of them (News Feed video). I think that was right, but it also follows that the former would be easier to monetize: after all, people are more likely to put up with an advertisement for a video they want to watch, as opposed to one they are watching because it happened to be presented to them. Indeed, the latter could be actively harmful, reminding people to simply close the app. To that end, reducing the time users spend watching videos that Facebook would never monetize effectively doesn’t seem like a particularly large loss. So excuse me if I take Facebook’s pronunciations about the harm its business will soon befall with a rather large grain of salt. 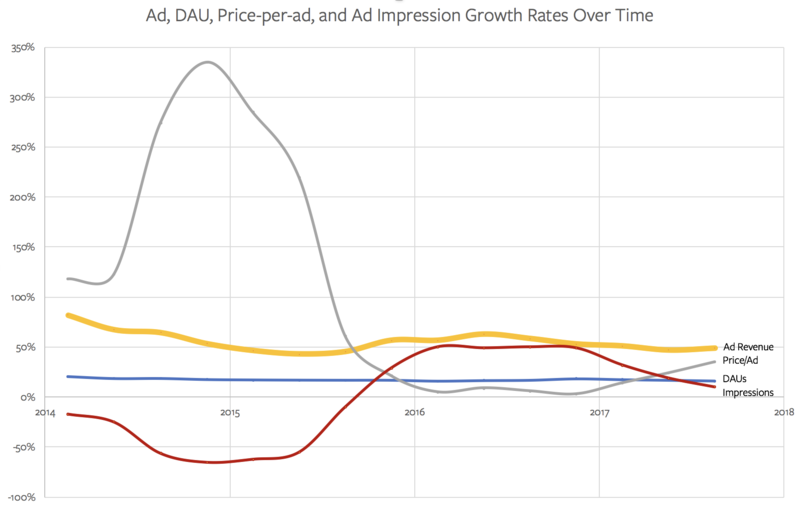 The company has already demonstrated it has pricing power such that its advertising revenue can continue to grow strongly even as the number of ads-per-user plateaus; moreover, that power further complicates any attempt to understand Facebook’s motivation. These structural advantages lend credibility to Facebook’s contention that it is making these changes with its users’ best interests in mind. After all, it ultimately won’t matter to the bottom line. Indeed, note that Zuckerberg made no mention of these changes impacting revenue, as he surely should have were this change to have a negative impact; in contrast, Zuckerberg warned that hiring new content moderators would impact profitability on the last earnings call. Of course one hesitates to give Facebook too much credit if this were the case: it would be a clear example of a Strategy Credit, where doing the right thing is easy because it doesn’t actually hurt the underlying business. That, though, may be reassuring in the short term, but it points to still more possible Facebook motivations. For about as long as Facebook has been a going concern, the conventional wisdom about their downfall has remained largely the same: some other social network is going to come along, probably amongst young people, and take all of the attention away from Facebook. In fact, as I argued last year in Facebook, Phones, and Phonebooks, the social sphere has room for many players — including networks that garner huge amounts of attention — but that Facebook’s position was secure. Make no mistake, in this analogy the phone book is where the money is at: Snapchat and Twitter are all struggling to monetize in large part because phones simply aren’t conducive to advertising.1 That, though, makes Facebook’s new focus even more interesting: if advertising struggles to find a place when users are more actively engaged (versus passively consuming content), why is Facebook seemingly going in the opposite direction? One possible answer is that conventional wisdom is right: Facebook may still have a hold on identity, but the amount of time users — particularly the most valuable users — are spending on the network is steadily decreasing.2 That may not be a problem for the business today, but it certainly could be in the long run. Another possible answer is that Facebook fears regulation, and by demonstrating the ability to self-correct and focus on what makes Facebook unique the company can avoid regulatory issues completely. The question, though, is how exactly would Facebook be regulated? There certainly is no crime in providing a free service that lets people connect with those they know. I suggested last year that perhaps Facebook’s monopoly power could be seen in its seeming inability to help publishers monetize or especially in digital ads, but those cases are far more theoretical (or in the case of publishers, fantastical) for now. This is why I find Facebook’s focus on what is good for users to be so fascinating. On one level, maybe the company is, as they can afford to be, simply altruistic. On another, perhaps they are diverting attention from problematic trends in user engagement. Or perhaps they are seeking to neutralize their biggest threat by addressing it head-on. I don’t know which of these motivations are correct — probably there is truth in all of them — which is precisely why I find this announcement so fascinating. This change could have been made and justified without even broaching the idea that Facebook might be bad for you; why did Facebook rest everything on that reasoning? It certainly is hard to escape the election of President Trump. I have argued regularly that I don’t believe that fake news was a causal factor in Trump’s election, and I think that Facebook has been a convenient scapegoat for many. On the other hand, I made the case back in the primaries that Facebook’s decimation of the media led to a correlated decimation of the parties’ ability to control the presidential candidate selection process, creating the conditions for a candidate like Trump to arise. In other words, I do blame Facebook for Trump, but for structural reasons, not causal ones. And even then, Facebook is a stand-in for the Internet’s effect broadly: were it not Facebook ruining media’s business model, it would have been some other company. Zuckerberg, though, has always seemed to tilt towards the more utopian side of the spectrum when it comes to the Silicon Valley cliche of “changing the world.” The ardent belief that sharing and connecting will fix everything has been a fixture in Zuckerberg’s public comments ever since he emerged into the public sphere, and the CEO effectively declared at the 2016 F8 conference that Trump was in opposition to that. Progress now requires humanity coming together not just as cities or nations, but also as a global community. This is especially important right now. Facebook stands for bringing us closer together and building a global community. When we began, this idea was not controversial. Every year, the world got more connected and this was seen as a positive trend. Yet now, across the world there are people left behind by globalization, and movements for withdrawing from global connection. There are questions about whether we can make a global community that works for everyone, and whether the path ahead is to connect more or reverse course. Our job at Facebook is to help people make the greatest positive impact while mitigating areas where technology and social media can contribute to divisiveness and isolation. Facebook is a work in progress, and we are dedicated to learning and improving. We take our responsibility seriously. Even if Zuckerberg is right, is there anyone who believes that a private company run by an unaccountable all-powerful person that tracks your every move for the purpose of selling advertising is the best possible form said global governance should take? Facebook’s stated reasoning for this change only heightens these contradictions: if indeed Facebook as-is harms some users, fixing that is a good thing. And yet the same criticism becomes even more urgent: should the personal welfare of 2 billion people be Mark Zuckerberg’s personal responsibility?